The rule also proposes a single payment rate for level 2 through level 5 office visits as well as a primary care payment bump. 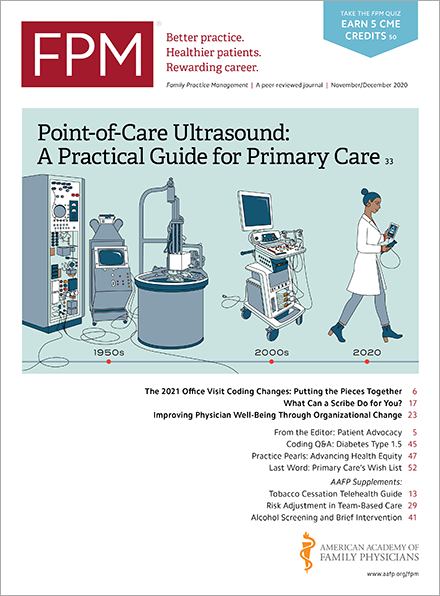 The July/August issue of FPM addressed strategies for distinguishing between 99213 and 99214 office visit codes. That distinction may soon become easier to document but essentially irrelevant to payment. On July 12, the Centers for Medicare & Medicaid Services (CMS) released its proposed changes to the Medicare Physician Fee Schedule for 2019(www.federalregister.gov). The proposed rule contains, among other updates, significant revisions to the coding and documentation of office visit evaluation and management (E/M) services (codes 99201-99215); see page 331 of the proposed rule(s3.amazonaws.com). The changes follow years of auditing from Medicare contractors and widespread concerns from the medical community that existing E/M documentation guidelines no longer reflect current practices and result in unnecessarily burdensome documentation requirements. Read a summary of the AAFP's 92-page letter to CMS outlining its comments and concerns regarding the proposed rule. When selecting a level of service for office or other outpatient services, beginning Jan. 1, 2019, physicians would have increased options available. In addition to using the current 1995 and 1997 documentation guidelines, physicians could select the level of service based on time or by using medical decision-making alone, regardless of the level of history or physical exam performed (see page 335 of the proposed rule). The option to select a level of service based on the duration of the visit relaxes existing requirements. Currently, selecting a visit based on time requires documentation of the duration of face-to-face time with the patient and greater than 50 percent of the visit must be spent in counseling or coordination of care. Medicare’s proposal would eliminate this second requirement, simply allowing physicians to select a code based on the total length of the visit even if counseling did not dominate the service time. (see page 338 of the proposed rule). Especially for new patient visits, which currently require meeting requirements for all three key components of history, examination, and medical decision-making, satisfying requirements for higher levels of service can be difficult. Physicians have long complained that the points system for history and examination components result in unnecessary documentation that does not contribute to patient care. As a result, Medicare proposes to allow physicians to select their level of service for both new and established patient office visits using only the medical decision-making component. The requirements for medical decision making would remain the same. Recognizing several common E/M documentation guideline complaints, Medicare proposes to no longer require physicians to re-record information regarding the chief complaint and history of present illness previously documented by ancillary staff (see pages 343-345 of the proposed rule). The method of supporting your level of service, in some respects, may be a distinction without a difference under the proposed rule. Level 2 through level 5 new and established office visits, respectively, would have a single payment rate regardless of the code reported (see page 349 of the proposed rule). New patients (99202-99205) would be paid at approximately the midpoint between a 99203 and 99204 (see page 349 of the proposed rule), assigning 1.9 work RVUs to new patient visit codes. (Compare that to the 2018 rates for 99203 at 1.42 work RVUs and 99204 at 2.43 work RVUs, with a midpoint of 1.925.) Established patient visits (99212-99215) would be paid just under the midpoint between 99213 and 99214 (see page 349 of the proposed rule), assigning 1.22 work RVUs to established patient visit codes. (Compare that to 2018 rates for 99213 at 0.97 work RVUs and 99214 at 1.5 work RVUs, with a midpoint of 1.235.) The following tables from the proposed rule illustrate the potential financial impact using 2018 work RVU and conversion factor values. Visits with a focus on primary care can receive a bump in payment by reporting a new add-on code (GPC1X), with a proposed work RVU of 0.07 and an estimated value of $5 per visit. Physicians should note that these modifications, if finalized, would only apply to office visit codes and only for Medicare. As a result, the existing 1995 and 1997 E/M guidelines will continue to apply for other services such as hospital visits, and for commercial payers. Although Medicare is only proposing changes to codes 99201-99215 at this time, the agency indicates it intends to use a stepwise approach and expand its finalized policy to other E/M code categories in coming years (see pages 331-332 of the proposed rule). Note: The release is scheduled for official publication in the Federal Register July 27, 2018. Page references are subject to change upon publication of the Proposed Rule in the Federal Register.